A study outline of the four invasions of Israel by the Assyrians followed by the three groups of aliens resettled in the land of Samaria. The Scriptural record of the invasions is examined together with the testimony of the monuments containing inscriptions of the deportations of Israel by the Assyrian kings. These cuneiform inscriptions may be seen in the British Museum and they only confirm the Scriptures and in no way contradict them. "And the Lord said unto him Call his name Jezreel; for yet a little while and I will avenge the blood of Jezreel upon the house of Jehu and will cause to cease the kingdom of the house of Israel"" (Hos. 1: 4). "And God said unto him Call her name Lo-Ruhamah; for I will no more have mercy upon the house of Israel; but I will utterly take them away" (Hos. 1: 6). The First speaks of the Fall of the Kingdom. The Second speaks of the Deportation of the Nation. No fixable dates are given for these events. It is evident that the two events were not to be synchronous; the nation is not to be carried utterly away at the time of the fall of the kingdom. contemplated attacking Ahaz king of Judah. "Within three score and five years shall Ephraim be broken that it be not a people" (Isa. vii: 8). Here fortunately we are able to fix approximate dates for these words were uttered just before 741 B.C. And we are told that within sixty-five years Israel would be broken so that it would be no longer "a People" obviously a People in Palestine. It says nothing about the cessation of the Kingdom in the land but only the cessation of the Nation there. Hosea's Lo-Ruhamah prophecy and Isaiah's Three Score and Five Years prophecy describe the same event; they are synchronous and refer to a complete transportation of the entire nation from Palestine. Sixty-five years from 741 would be about 676 B.C. a crucial date in the history of Israel and one to be borne in mind. 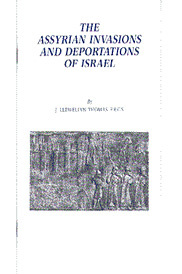 Mr. Thomas gives much detailed and Scriptural information to prove his theory of the four deportations even going so far as to give an outline of the substance of the contrarian view to the deportations by the principal dissenters of that contrarian view showing where they missed the mark in their analysis. An excellent study for the individual or within a study group.